The WMCHealth Heart and Vascular Institute is investing in the very best cardiovascular care for patients in the Hudson Valley — and, through innovation and growth, is transforming local healthcare. Powered by the world-class resources of WMCHealth’s 10-hospital network, the Institute is seamlessly blending exceptional medical expertise, state-of-the art technology and a trusted, steadfast commitment to patient-centered care. Highly trained teams of specialists, nurses, physician assistants and allied health professionals work together to provide a seamless continuum of care across WMCHealth’s eight campuses. Whether it is preventive care at a cardiologist’s office nearby, diagnostic screenings at a community hospital or more complex procedures at regional hospitals, patients know they are getting the best, most comprehensive care. The WMCHealth Heart and Vascular Institute’s dynamic growth allows the health network to provide the finest cardiology, cardiovascular surgery, cardiothoracic surgery and pediatric cardiovascular services, for almost every conceivable heart and vascular disorder, right in the communities where people live. Geographic expansion: The WMCHealth Heart and Vascular Institute now offers nine locations, complementing WMCHealth Network hospitals, enabling quality care close to home. The Hudson Valley focus has expanded to include services on Long Island and as far north as Delaware County. Innovation: Responding to emerging public health needs, the Institute has introduced Pulmonary Hypertension and Hypertrophic Cardiomyopathy programs. Highly skilled teams are at the forefront of the fast-growing subspecialty of Electrophysiology. The new TeleCardiology Program gives cardiologists anywhere in the WMCHealth network the ability to conduct virtual, face-to-face consultations with medical teams and patients. Investing in the future: The $230 million Ambulatory Care Pavilion opening on the health network’s flagship Valhalla campus in 2018 will include a Heart Center, offering outpatients a full spectrum of cardiovascular treatment. The $21 million renovation of six cardiac catheterization labs at Westchester Medical Center, and a partnership with Philips, are creating the cath labs of the future. Academic advancement: An academic affiliation with New York Medical College engineered the creation of the Cardiovascular Translational Science Institute. This collaboration brings together basic lab scientists with clinical investigators who work with patients to fine-tune new cardiovascular breakthroughs. The Institute is committed to research that advances already expert care. In addition, the Heart and Vascular Institute offers robust Continuing Medical Education programming throughout the year. 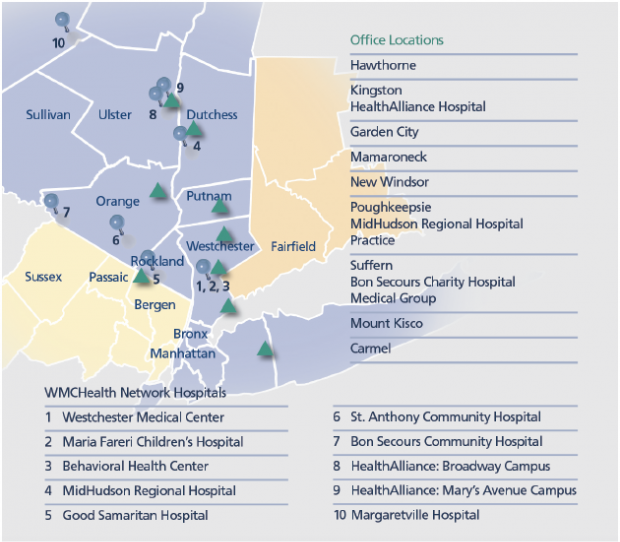 The WMCHealth Heart and Vascular Institute’s mission is to provide patients who live throughout the greater Hudson Valley region and southwestern Connecticut the highest level of care, close to home. To learn more about the WMCHealth Heart and Vascular Institute, go to westchestermedicalcenter.com/heart.